U.S. Secretary of State Mike Pompeo shakes hands with Turkish Foreign Minister Mevlut Cavusoglu at the State Department in Washington, June 4, 2018. The United States and Turkey have agreed on a roadmap to resolve the future of the northern Syrian city of Manbij, an issue that has become a major source of tension between the NATO allies. The agreement came during a meeting between U.S. Secretary of State Mike Pompeo and Turkish Foreign Minister Mevlut Cavusoglu in Washington on Monday. “They endorsed a roadmap to this end and underlined their mutual commitment to its implementation, reflecting agreement to closely follow developments on the ground,” the statement said, adding that the two sides agreed to hold further meetings to resolve outstanding issues. 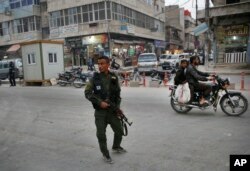 FILE - A member of the Kurdish internal security forces patrols a commercial street in Manbij, north Syria, March 28, 2018. Manbij, a mixed Arab and Kurdish town of nearly 400,000, was liberated from Islamic State militants in 2016 by the YPG fighters with backing from U.S-led coalition airstrikes. The U.S. State Department did not provide further details about the agreement. However, Cavusoglu told Turkish journalists in Washington Monday that U.S.-backed Kurdish fighters will withdraw from Manbij under a plan that could be implemented within six months. He said U.S. and Turkish officials would temporarily ensure security in Manbij. “The aim of this roadmap is the clearing of Manbij of all terror organizations and the permanent instatement of safety and stability,” Cavusoglu said. Washington’s support of the Syrian Kurdish YPG militia in the war against the Islamic State group has angered Turkey. Ankara calls the YPG terrorists, accusing the militia of being linked to a Kurdish insurgency inside Turkey. The Syrian town of Manbij, which was seized from Islamic State by mainly YPG forces, has become the epicenter of Turkish-U.S. tensions. Ankara claims Washington reneged on an agreement that the militia would withdraw after taking Manbij. Former U.S. ambassador to Turkey James Jeffrey told VOA’s Turkish service that although there are problems between the United States and Turkey, the ties between the countries would not break down. However, he acknowledged there will be difficulties between the countries going forward. “The relationship will also be fraught with problems because it is very complicated,” he said. Jeffrey said the most difficult problem between two countries is Turkey’s agreement to buy the S-400 anti-aircraft missile system from Russia, a non-NATO country. Turkey’s move to buy the surface-to-air missile system, which is incompatible with NATO systems, has unnerved NATO member countries. In response, a U.S. Senate committee has threatened to prevent Turkey from purchasing U.S. Lockheed Martin F-35 fighter jets. Dorian Jones, Nike Ching, Serhan Akyildiz and Erhan Polat contributed to this report.